Understanding and solving intractable resource governance problems. I first met Dr. Elinor Ostrom when she came to The University of British Columbia as a Visiting Professor and stayed at Green College. While at the time, none of my PhD research really had anything to do with neoinstitutionalism or rational choice theory per se, I knew of her work and read much of her scholarly production because I wrote PhD comprehensive exams in Political Science and Comparative Public Policy. She was invited to speak at the Institute for Resources, Environment and Sustainability (where I did my PhD) and also gave a few other public lectures, several of them at Green College (where I lived as a graduate student). Dr. Ostrom brought along on her trip her husband, Dr. Vincent Ostrom. After giving a brown-bag lecture, I walked them back to Green College and they graciously offered to buy me lunch. We spent the next 3 hours discussing neoinstitutionalism, rational choice theory, and which Mexican scholars were doing common pool resource theory (CPR). Elinor (or Lin as most people called her) wanted to connect me with a fantastic Mexican scholar who went to become a very close friend of mine, Dr. Leticia Merino-Perez from the Social Research Institute at UNAM. Lin and Leti had done collaborative work on Mexican forest resources management. Lin and Vincent were incredibly generous with their time during their visit, we spent breakfasts, lunches and dinners at Green College chatting and they were very sweet to me, teaching me about ways of looking at governing natural resources using robust institutions and I can confidently say that they were the reason, and in particular Lin Ostrom, that much of my scholarly work now uses neoinstitutional theory. 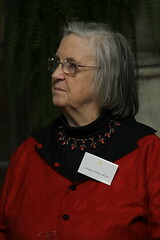 I feel this loss as a very personal one as I did have a personal albeit brief connection to the Ostroms, but I can’t help but also share in the collective grief of everybody who knew Lin Ostrom. Her work demonstrated that ordinary folks can and often do build robust norms and rules (institutions) to govern resources in a sustainable manner. I became fascinated by the study of institutions when I met Lin Ostrom, and I hope to carry the torch in the future with my own scholarly work. Rest in peace, Lin. You made your mark in the world, much more beyond the Nobel Prize. And thank you for your teachings. Tagged with common pool resource theory, Dr. Elinor Ostrom, scholarly research. What does Joli Jensen’s “low stakes, constant contact with a writing project” mean in practice?